Many of the card offers that appear on this site are from companies from which Credit Card Tune-Up receives a commission for new cardmembers (e.g. Barclays, American Express, etc. ), though many offers are from companies with which there is no such partnership (e.g. PenFed, Fort Knox FCU, Navy FCU, First National Bank, etc.). However, these commissions do not impact how or where products appear on this site, including the order in which they appear. Other factors, such as our own proprietary website rules (e.g. reward currency valuations) do impact how and where products appear on this site. 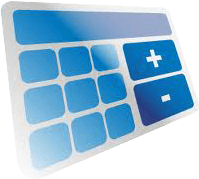 The Credit Card Tune-Up calculation engine does not include the entire universe of available credit card offers. It can be daunting to choose reward credit cards that are right for you. Credit card companies offer dozens of competing cards and their reward structures for cashback, frequent flier miles, and points are a complex mix of categories, tiers, limits, and earning percentages. The Credit Card Tune-Up calculator makes all of that easy. Just choose your filter criteria in the box on the right, plug in how much you spend each month, and press the Recalculate button. You'll then be presented with a list of the cards in our calculation engine sorted in descending order by the expected value of your first-year rewards minus any annual fee. All reward types -- miles, points, cashback -- are converted into dollars for an easy apples-to-apples comparison. You can hover over a calculated dollar amount to see any details about how points or miles are valued for that card. Note that these valuations are based on our research and not assigned by the card companies. Only the "Total you spend per month" amount is required, but entering your expenses by category can make a significant difference in possible rewards. Since there is no "Other" category, don't worry about having your category amounts add up to your total amount; the calculator figures out your "Other" spending for you. To apply for credit cards or read the terms and conditions, you can click on the card name link or "Apply Now" button. Also, applying for credit cards through the category links above helps support this web site. For a detailed explanation of any credit card, category, or reward amount, hover your mouse pointer over that item. Card detail bullets can also be toggled with the "Show Details" button. To exclude a credit card from the "Best N-Card Combo" results (those with amounts highlighted in green), check its checkbox in the "Omit Card from Calc?" column and press the Recalculate button. The first-year annual fee that was subtracted from the first-year reward value of this card is $450. The first-year annual fee that was subtracted from the first-year reward value of this card is $95. 2X points on travel and dining at restaurants & 1 point per dollar spent on all other purchases. Earn 100,000 Hilton Honors Bonus Points with the Hilton Honors American Express Card after you use your new Card to make $1,000 in eligible purchases within the first 3 months of Card Membership. Receive 50,000 bonus points- a $500 value - after you make at least $3,000 in purchases in the first 90 days of account opening. If you're a Bank of America Preferred Rewards client, you can get a 25%-75% rewards bonus on every purchase. Flexibility to redeem for a statement credit, deposit into eligible Bank of America® or Merrill Lynch® accounts like checking, savings, and 529, for gift cards or use at the Bank of America Travel Center. $250 statement credit after you spend $1,000 in purchases on your new Card within the first 3 months. Low intro APR: 0% for 12 months on purchases and balance transfers, then a variable rate. The first-year annual fee that was subtracted from the first-year reward value of this card is $75. 0% intro APR on purchases and balance transfers for 12 months, then a variable rate, based on your creditworthiness and other factors. Earn 4X Membership Rewards® points at US restaurants. Earn 4X Membership Rewards® points at US supermarkets (on up to $25,000 per year in purchases, then 1X). Earn up to $10 in statement credits monthly when you pay with the Gold Card at participating dining partners. Enrollment required. The first-year annual fee that was subtracted from the first-year reward value of this card is $250. Earn 40,000 bonus Asia Miles after spending $2,000 or more in the first 90 days of opening your account. Offer expires December 31, 2018. Earn 60,000 bonus miles after you spend $2,000 in purchases on your new Card within your first 3 months. Offer Ends 01/30/2019. Earn 2 miles per dollar spent on eligible purchases made directly with Delta. Earn 1 mile for every eligible dollar spent on purchases. Check your first bag free on Delta flights -that's a savings of up to $200 per round trip for a family of four. The first-year annual fee that was subtracted from the first-year reward value of this card is $195. Earn up to $250 back. Here's how: Earn a $150 statement credit after you spend $1,000 or more in purchases with your new Card within the first 3 months of Card Membership. Plus, earn an additional $100 statement credit after you spend an additional $6,500 in purchases within your first 12 months. Low intro APR: 0% for 15 months on purchases and balance transfers, then a variable rate. With Plan It℠, you can set up a monthly payment plan for large purchases with a fixed monthly fee and no interest charges, all with the same rewards and protections you expect from American Express. The first-year annual fee that was subtracted from the first-year reward value of this card is $89. Susan G. Komen® has received more than $8 million from Bank of America from this program since 2009. 0% Introductory APR for 12 billing cycles for purchases and for any balance transfers made in the first 60 days, then a variable APR. 3% fee (min $10) applies to balance transfers. Earn 30,000 bonus points, which can be redeemed for $300 cash, when your net qualifying purchases made in the first 90 days total $2,000 or more. Regions Relationship Rewards offers 1.5 points for every $1 in qualified purchases. Redeem points for travel, merchandise, or cash back. Card benefits include Purchase security, Price Protection, Lost Luggage Reimbursement, Visa Signature Concierge, Trip Cancellation/Interruption and Roadside Dispatch. The first-year annual fee that was subtracted from the first-year reward value of this card is $125. Enjoy a free reward night when you redeem points for any stay of 4 or more nights. Earn 5 points per $1 spent when you stay at an IHG hotel. The first-year annual fee that was subtracted from the first-year reward value of this card is $29. Earn Companion Pass and 30,000 points after you spend $4,000 on purchases in the first 3 months. Offer ends 2/11/19. Companion Pass is promotional and will be valid through 12/31/19. The first-year annual fee that was subtracted from the first-year reward value of this card is $69. New Cardholders - earn a $100 Bonus! Open a new account and get a $100 cash back bonus by spending $1,000 within 90 days of opening your account. No international transaction fees on credit purchases. The first-year annual fee that was subtracted from the first-year reward value of this card is $99. 0% APR promo balance transfer rate for 12 months now through March 31, 2018. After that, the APR for the unpaid balance and any new balance transfers will be 9.74% to 17.99%. APR will vary w/the market based on Prime Rate. 3% balance transfer fee per transaction. Subject to credit approval. $100 bonus after spending $1,500 in purchase transactions within 3 months of account opening. Rate and offers current as of January 1, 2018 and subject to change. The first-year annual fee that was subtracted from the first-year reward value of this card is $550. 2% back at restaurants, gas stations, and drug stores. The first-year annual fee that was subtracted from the first-year reward value of this card is $39. Earn 1% Back on Purchases: Redeem for cash back, gift cards, travel or merchandise. Double Your Rewards: Choose to redeem your rewards into your checking, savings, mortgage or NEST 529 account for a higher value of 2% back. Earn up to a $50 Bonus. Make a purchase in the first 3 billing cycles and you'll earn enough rewards to redeem for $25 in cash back, gift cards, travel or merchandise. Get $50 if you choose to redeem your bonus rewards into your checking, savings, mortgage or NEST 529 account. © Ansible Enterprises, Inc. All rights reserved.